At Legoland Windsor, the Pacific team dreamed big in order to bring the Lego City Driving School and water-based Coastguard HQ segments to life - capturing visitors’ imaginations. The I’m a Celebrity… Get Me Out Of Here! attraction required an interesting blend of lighting techniques and environmental elements to replicate the show’s feel in a scary but light-hearted installation. 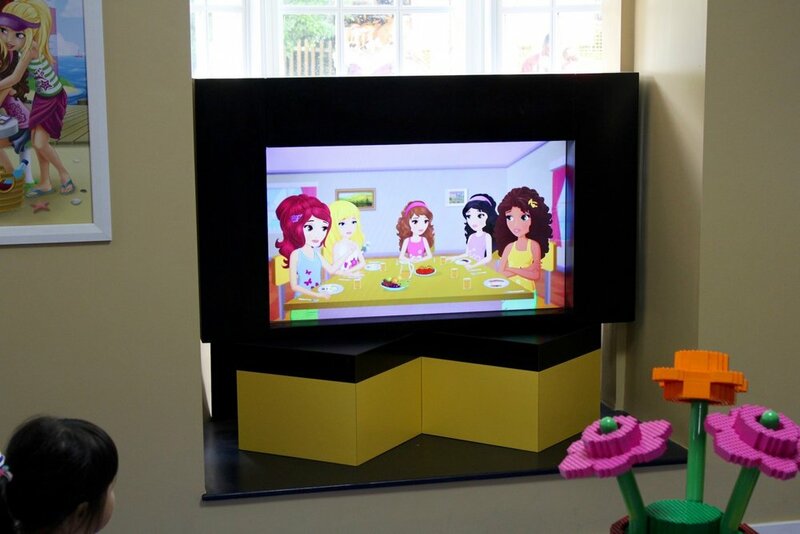 The Lego Friends installation saw Pacific introduce interactive displays and electronic attractions to the theme park, adding extra layers of immersion and creating a truly hands-on, tactile experience. By far our largest installation at Madame Tussaud’s is the Star Wars experience. Covering 16 distinct spaces and overseen by Disney and Lucasfilm, this attraction required us to help recreate several beloved movie moments and setpieces as authentically as possible. To bring each area to life, we used our AV experience to devise a central audio system controlled by an Alcorn McBride Protraxx digital sound processor which allows the soundtracks in each zone to be controlled from a single point. This allowed us to channel in both background and area-specific audio via a combination of microdot speakers, Ottocanali multi-zone amplifiers, and localised sound showers. Highlights of the installation include the Duel of the Fates, which features Obi-Wan Kenobi, Qui-Gon Jinn and Darth Maul engaged in a lightsabre battle. Each character has their own microdot speaker projecting battle sounds and dialogue, with each lightsabre lit up with screen-accurate LED lighting. This is accompanied by an enormous vertical glass tube lit up by 1600 fibre optic strands with a pre-programmed flashing sequence. Later in the experience, the Dagobah scene features the waxwork Yoda in a dimly-lit swamp area. This is brought to life by creeping background audio and a Gem Glaciator fog machine, allowing the fog to stay close to the floor creating a lifelike swamp environment. Yoda has a sound shower directly in front of him which plays a loop of ten of his most famous sayings. To recreate the famous "I am your father” scene, the imposing 6’7” figure of Darth Vader stands on a balcony above a small pit. When visitors approach the opposing glass cylinder, a motion sensor triggers two giant DMX theatre fans to create an upward gust of wind from below - and a directional sound shower delivers the famous line. Another highlight is Jabba’s Palace, which features a local speaker playing Jabba’s booming phrases from behind the characters of Jabba the Hutt and Princess Leia. Underfoot, bass shakers and localised audio recreate the movement of the fearsome Rancor beneath. Further on, Anakin Skywalker stands on a small raft in a river of burning lava. Four Dimplex water effect fires create the appearance of lava using water, lights, and mist, accompanied by a fog machine. Beneath the raft RGB LED strips flicker in a controlled sequence, and the rear walls are augmented with PTZ projections from two Rosco projectors to create the illusion of movement along the lava flow. Finally, a ScentAir machine creates the smell of fire to complete this immersive scene. But by far the centrepiece of the experience is the Millennium Falcon cockpit - the most complex and most interactive feature of the attraction. Visitors take a seat alongside Chewbacca for a multi-faceted sequence simulating the jump to hyperspace. The visual effect of the hyperspace jump was achieved by playing six different video sequences through Brightsign HD 220 media players and rear-projecting the image through six ultra-short throw Optoma projectors onto ultra-black projection film on the outside of the cockpit. Bass shakers underneath the seat and in the side wall create an intense rumbling sensation. The sequence is triggered by a giant red button which uses Extron transmitters and receivers with CAT5 cable to run the signal to the projectors. The overall effect is breathtaking and has proved immensely popular – in fact, the sequence had to be shortened as the attraction’s popularity would cause huge queues to form! As a final touch, we also installed a unique feature for the Madame Tussaud’s staff to enjoy behind the scenes! A central stairwell is surrounded by star cloth and fifteen lightsabres hang from the ceiling, creating a one-of-a-kind lighting setup. suspended at varying heights, the sabres hang from a raft and use a DMX controller to light up in sequence. This was entirely designed, hung, programmed, and cabled by Pacific and is the only one of its kind in the world. The entire gift shop is outfitted with background audio and features two motion-activated sound showers – one in the entrance playing R2-D2’s distinctive sound effects, and another playing all of the featured characters’ dialogue in rotation. This is positioned in front of a mirrored screen which displays character images to create another immersive moment. Our work at Alton Towers’ CBeebies Land gave us the chance to breathe life into characters from beloved properties such as Postman Pat and In the Night Garden, creating a magical experience for its young visitors. Here we again we utilised specialist outdoor sunlight readable displays for the queue lines. 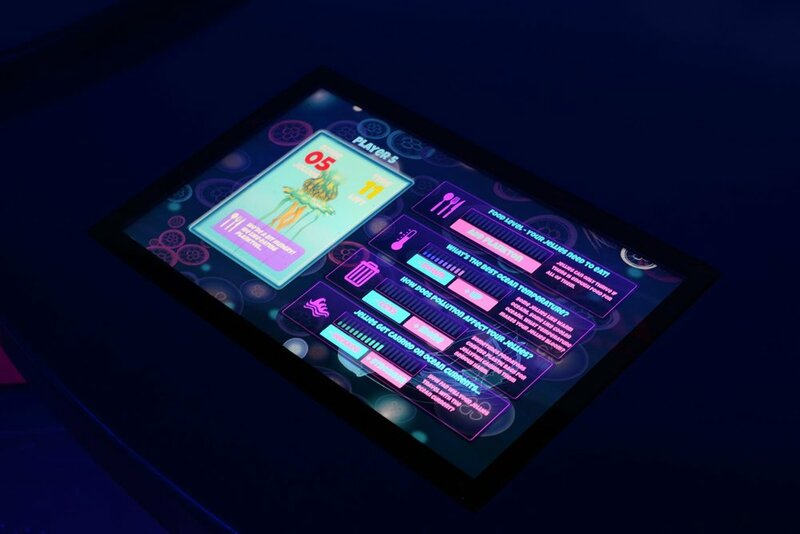 Integration between the queue signage and the 4D cinema experience has ensured a consistent experience from queue to attraction, this has been coupled with an integrated Audio system covering the surrounding area. Pacific and the London Eye have developed a solution to reliably update all content on the 192 tablets installed on the Eye, this had been an area of concern when utilising the Merlin network. We have worked with the 3rd Party supplier of the App to ensure the solution for the Eye, this included installing wireless to cover the Eye, and creating a web download server.